Welcome to a special Caturday: Vet Visit Edition. Pandora, being a ripe old 13 years of age, has intermittent urinary mishaps in the locale of her litter box (occasionally referred to as “Pandora’s Box”), which I have taken in stride with a handful of paper towels, a bottle of environmentally friendly non-bleach sage and citrus all-purpose cleaner, and trips to the laundry room with the bathroom rug. The last few weeks, however, have seen an escalation in the occurrence of her “thinking outside the box,” which has resulted in more frequent than usual rug launderings and bathroom floor cleanings. I was in denial about the possibility of a urinary tract infection, even after an impromptu late-night on-the-bed “liquidation” which ruined my mattress and sent me to Craigslist for a new one. (I still have to tell you my mattress story, by the way.) 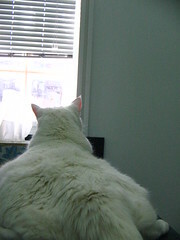 The second time I found a giant cat urine stain on my bed at 3AM, however, (by God’s grace I had been up doing my taxes so it did not touch me as I slept) I knew it was time to call the vet. 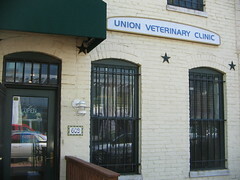 Union Veterinary Clinic is just a few blocks away. Quite appropriately, the vet was named “Dr. 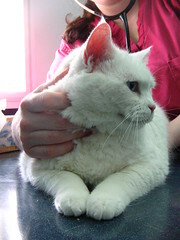 Kats.” Pandora was weighed, probed, rectally thermometered, and generally checked out. I left her there for the day so they could do a urinalysis and give her some long overdue booster shots, and picked her up later that evening, none the worse for the wear. The total damage: $295, and the results of the urinalysis will come in next week. There appear to have been bacteria and red blood cells in her urine, and culturing will show if this is an infection. Otherwise it’s a behavioral problem, and I’ll have to retrain her in litterboxing. This was Pandora’s first time outdoors in, like, ever. She was very calm and cooperative about the whole thing, and took to her carrier just fine. My gangly arms, however, are aching.